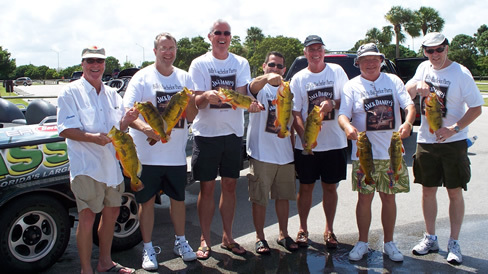 Today we had the pleasure of taking out a bachelor party for a Florida freshwater fishing excursion. With the storms in the area, they did not want to risk an offshore fishing trip and have it spoiled by large seas and no fish. So, they called us with the idea of hosting there bachelor party for 7 people guys who love to have fun. We suggested with strong winds to focus on the South Florida canals, they agreed. They decided to hire three of our guides to go bass fishing for the day, so Capt Brett , Tony and Bobby decided to take them to Lake Ida in Palm Beach County. What can we say that the picture doesn’t, other then these guys ended up “stroking” the peacock bass, there group ended up catching over 70 peacock bass. As they said, it would of never happen like this offshore!